"We the people of the United States, in order to perform more perfect Union, do establish justice of the United States, insure domestic Tranquility, provide for the common defence, promote the general Welfare, and secure the Blessings of Liberty to ourselves and our Posterity, do ordain and establish this Constitution for the United States of America." "The Obama administration has been found criminal and corrupt. Impeachment will take place this week, and all administrative officials who have continuously broken the laws of our constitutional republic will be tried, convicted and brought to justice." Would you not be shocked? But why is that? It's because American citizens have fallen so far from the Bible, the U.S. Constitution and, of course, what our forefathers established that we think justice is impossible. I am reminded of the true story of William Wallace - most of you know him as "Braveheart." William was told by the "Nobles" of Scotland that it was impossible to defeat the tyrannical king of England and his minions (which held Scotland in captivity to their tyrannical ways). They were too many (which is completely opposite of America's state), too strong in every way for Scotland ... or so they thought. This one man, William Wallace, knew more than the "Nobles" of Scotland. He knew that freedom was not a gift granted to them by mere men or a tyrant king, but freedom was a right guaranteed to every man by God, which has been summed up in our Declaration of Independence. He hoped against all odds, believed God for the impossible - and look at the results! Now take that to America. The "Nobles," or shall we say most congressmen and women, will not stand up against the crimes that have befallen "we the people" at the hands of this administration. They have titles and positions they don't want to lose, much like the "Nobles" of Scotland in the day. But the tyrannical king of England was not defeated by the "Nobles." He was defeated by the people. 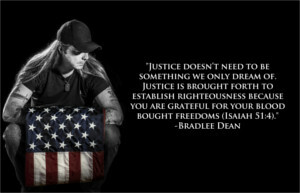 Justice doesn't need to be something we only dream about. Justice is brought forth to establish righteousness because you are grateful for your blood-bought freedoms (Isaiah 51:4). "Sad will be the day when the American people forget their traditions and their history, and no longer remember that the country they love, the institutions they cherish, and the freedom they hope to preserve, were born from the throes of armed resistance to tyranny, and nursed in the rugged arms of fearless men." In our pledge we state, "With Liberty and Justice for All." It doesn't say justice for all unless you are the president of United States or an attorney general, or the Congress, does it? The word "Justice" applies to all and means all! If America fails to bring forth justice, rest assured tyranny will reign.